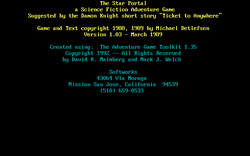 The Star Portal is a science fiction Eamon adventure planned by Michael Detlefsen for use with his Atari ST Eamon port. Announcing it in his newsletter in April 1987, Detlefsen said that the adventure was still in the early stages of development ("barely blocked out" with "only 60 rooms so far") and that he expected it would take at least several more months to complete; however, Detlefsen abandoned his Atari ST platform in 1987 in favor of the PC-based Adventure Game Toolkit system, and the adventure was never finished for the Atari. In 1988 Detlefsen completed Star Portal as an AGT adventure.